The Master of Advanced Studies in Intercultural Communication is your complete MAS program. Distributed across 18 modules in 3 countries, the MAS comprises two modules per week for a total of 9 weeks of study, plus a Thesis/Field Project. The main part of each module will be taught face-to-face over three days of intensive instruction (22 hours course work plus 2 hours of Intercultural Atelier). The individual preparation for each module, to be done before classroom instruction, consists mainly of reading and analyzing documents (articles, websites, etc.). All preparatory materials are available in advance on the e-learning platform reserved for participants. The evaluation of students' performance for each module is based on an academic assignment. This work has to be prepared by the student at home and has to be sent by email by the deadline set by the Academic Director. Participants usually have between 6-8 weeks to complete their certification paper. Each of the first 18 modules of the master is structured in the graphic below. An interdisciplinary theoretical framework for understanding how culture and cultural differences shape interpersonal, intergroup, and mediated communication. You will be introduced to concepts of culture, communication, and identity. The module will outline principles for inclusive communication with Others based on recognition of differences, privileges, and disadvantages. This module will present theoretical concepts and methods for analyzing how meanings are constructed linguistically and visually in interpersonal and mediated communication. Let us follow Gumperz’ argument that "conversational interpretation is cued by empirically detectable signs, contextualization cues, and that the recognition of what these signs are, how they relate to grammatical signs, how they draw on socio-cultural knowledge and how they affect understanding, is essential for creating and sustaining conversational involvement and therefore to communication as such" (1992, 42). Acknowledging that context can be co-constructed by the persons involved, we will work on the analysis of intercultural interpersonal communication. To analyze, deploy and create visuals in intercultural settings, by consciously leveraging the universal advantages of visual mapping for intercultural communication, while being aware of the cross-cultural variations in their interpretation. Practical applications to facilitating intercultural communication. The plea of intercultural education is to « take culture seriously in education »: what should this mean for intercultural education? Why are school systems so weak in promoting the school success of students from minority groups? How far are teachers competent to acknowledge cultural diversity, to address the needs of students with diverse cultural references and diverse experiences? What difficulties do teachers encounter in teaching a diverse class, what difficulties do teachers’ trainers experience in preparing teachers for interculturality? After identifying the different facets of the cultural dimension of education, we will critically consider what has been accomplished by intercultural education so far. To define and explicate approaches to the training of intercultural competence, with a focus on distinguishing those based on cross-cultural psychology and intercultural communication. New media, social networks, cultures and «sub-cultures». The impact of culture at the level of the individual, the team, and the organization. This module aims to provide a comprehensive understanding of the issues involved in cross-cultural management. It will focus on the impact of culture at the level of the individual, the team, and the organization; it will demonstrate how cultural factors influence behaviors in the workplace and will develop some of the skills needed to manage effectively in cross-cultural situations. Increase your awareness of the economic, social, political and ethical issues related to globalization. This course will be taught at the Kasetsart University, Thailand. Evolutions and «involutions» of cultures, in particular, national cultures, in view of economic and political changes. In the last 10 years, the world has changed tremendously because some countries/regions have emerged with very high rates of development. The BRIC countries, in particular, Brazil, Russia, India, and China, as well as a large part of the ASEAN region in South-East Asia. The impact these countries will have on the functioning of the world, not only from the economic point of view but also culturally, is an ongoing process. To comprehend the impact that both traditional values and societal changes have worldwide. ASEAN Shared Culture in the 21st Century. This module will present detailed information about intercultural communication research methods and project management. The focus of this module lies in understanding and identifying research methods appropriate to theory and research questions or hypotheses; managing projects. Have confidence in one’s ability to decide which method is most appropriate for answering research questions. Improve students’ ability to structure and manage Intercultural Communication Projects. Grasp basic data analysis procedure and presentation of results. In this course, we will begin with an overview of the literature on social change communication. We will examine how social change communication is defined, the frameworks of social change communication, and the methodological anchors for communication for social change. This overview will offer the basis for introducing the culture-centered approach to communication for social change, walking through the key concepts of the CCA, the role of social change communication from the global margins, and the transformative power of communication for social change when grounded in the voices of the margins. The course will critically interrogate the dominant ideas of development and situate these ideas in the backdrop of community voices at the global margins. The focus of the course is to analyze the complex relationship between the concerned actors and stakeholders. Development cooperation and humanitarian action, most often, bring together actors and stakeholders from different cultural backgrounds. Their relationships are complex, not only on account of this cultural diversity but also because of the ‘awkward nature’ of the relations between recipient and donors of official development assistance (ODA) compounded by differences of power and wealth, of historical experiences as well as by different goals and time horizons. It is a platitude to say that ever-accelerating flows of ideas, commodities and people across the globe are changing the nature of societies forever. The migration of people, real human bodies seems to present the greatest challenges to whatever sense of equilibrium may have prevailed in earlier times. Flows of people add to the complexity of societies and place demands on both the migrants and the hosts at individual and societal levels to think and behave differently in regard to “others.” Evidently, the old ways of engaging human diversity simply will not suffice in a closely-knit, interdependent world in which societal heterogeneity has become the norm and some form of integration has become imperative. This course will give delegates insight into how we came to think about differences the way we do in the modern era – which differences came to matter, and why -- evaluate some of theories and approaches that have been proposed to engage with diversity, and offer a critical perspective on how we may think in new ways and better equip ourselves for an interrelated future. Deep ideologies: the construction of difference in the modern social imaginary. Diversity dimensions, intersections, and unravelling binaries: National status, Race, gender, sexuality, disablilty, coloniality. Some theories/approaches to integration: Multiculturalism, “Berry boxes,” Cultural translation; Critical Diversity Literacy. Diversity in organisations: The challenges get personal. Dialogue: some principles and limitations. The approach of this module is to discuss and contrast different angles to the media’s role in cross-cultural encounters in society: insider perspectives and outsider perspectives; aspects of media production and journalism, and the changes that this field is currently facing; the change in media landscapes, and the changing functional aspects of media use in different cultural settings including the recent representations of migration into Europe. During the course we work to detect, identify and analyse mechanisms of inclusion and exclusion of culturally distinct groups. We also look at research on how the media address such situations. To broaden the spectrum, the analysis covers a multitude of different types of encounters: how different media represent and affect ethnicity; religion; immigrant- and diasporic communities; linguistic diversity and minority languages, and the possibilities and problems that come with new media technologies. The particular tasks of journalism with respect to conceptualizing the world, and in creation of self-identification and social competence are discussed against practical examples from different cultural settings. Attention is given to how media works in representing the cultural “self” and “others”, based on the literature distributed before the course. The role of the media is discussed against examples of good and bad practice. Useful practices in intercultural communication. After a general introduction to human rights, emphasis will be placed on the limits to fundamental freedoms and on the legal mechanisms that ensure respect for these freedoms at national and international level. Human rights (human rights) and / or "rights of cultures"; The legal choices of the State in the face of multiculturalism; Citizenship and integration policies today. In the second part, the course will concentrate on three guarantees that are essential today in a multicultural context. Freedom of religion in particular, the right to express one's religious beliefs and proselytism and the denominational neutrality of the state; Freedom of language, in particular, the status of official languages, and the conflict between freedom of language and the principle of territoriality; Equal treatment, in particular, the prohibition of discrimination. The course aims at familiarizing the students with the struggles over global, regional and state power, international conflicts, and global issues by providing a variety of historical, political, social, cultural and economic factors. To shed light on the evolution of the key concept of state sovereignty and on the opportunities, obstacles, and dilemmas linked to the implementation of human rights norms. Challenges of global and state security frameworks. The promotion of human rights and human security values: opportunities, obstacles, and dilemmas. In five units, we introduce participants to relevant social theory, present cutting-edge research findings, and discuss the applications and implications in various hands-on exercises. The module begins with how humans perceive the world and how immigration plays an important role in understanding and classifying the everyday. We then explore the consequences of this with regard to political representation, exclusion, the media, and right-wing populism to underline how migration poses a challenge to democracy. This module addresses macro (i.e. society) meso (i.e. community) and micro (i.e. individual and family) processes of integration. In order to set the scenery of such processes, the module begins by studying diversity of migrant population and integration policies in Europe; this allows locating the Swiss experience in the broader European picture. Moreover, it outlines the main theoretical approaches to integration in the scientific literature in order to provide a common background for the study of integration processes. More generally, the module shows the dynamic of ethnic boundaries at play in integration processes. Finally, the module tackles the issue of the interplay between processes of integration and migrants’ transnational practices. The first Unit is devoted to the post Berne Initiative global framework and initiatives in the governance of migration as the context for the EU free movement of persons. The following unit focuses on recent developments in the international framework of refugee and IDP protection in Switzerland, the Middle East and Europe. Unit 3 looks at the recent shift in research from a policy oriented to a migrant informed perspective of decision making in migration. The next section discusses border controls, visa policies and cross border services as well as smuggling and human trafficking, which are often purposefully confused in public debates. Unit 5 focuses on particularly vulnerable migrant groups and investigates the underlying factors and structures that create unequal power relations and dependency, how migration management regimes of control and enforcement are practiced and how they shape individual irregular migrants’ experiences in diverse ways. On the side of policy responses, the so-called durable solutions – local integration, return, resettlement – are addressed with particular interest being paid to the reactivation of resettlement regimes in Switzerland and EU countries (unit 6). Finally, we focus on the sub-state level and show the implications migration has on the regional and local level (unit 7). In particular, we analyse the challenges faced by minority regions, where new diversity stemming from migration encounters historical linguistic, religious and cultural diversity. Migration to and within minority territories. The role of culture and context in shaping health meanings, values and practices, and the linkages of these practices to health and wellbeing in migration and refugee contexts. Impact of legal, social, and economic factors on the health and well-being of refugees and internally displaced populations. *This module will be taught by the faculty of the American University of Beirut. The course aims to present and discuss the sociological and political philosophy issues related to multiculturalism. It starts from an apparently distant phenomenon, but which weighs heavily on these stakes, the rise of individualism and personal subjectivity in contemporary societies. It situates the issue in what is the major global change, globalization, and will invite the participants to "think global." And in the face of these phenomena, multiculturalism has been an institutional and philosophical response since the end of the 1960s. The content, the history, as well as the limits of this response will be discussed in light of the question whether intercultural dialogue could be another answer. The module will also address specific guidelines and measures for integration. Develop the concept of tolerability, focusing on establishing the latter's empirical validity through a quantitative approach. Diversity and multilingual public policy. Psychology offers a nuanced understanding of the link between the individual, emotion, cognition, and culture. How are the "cultural" dimensions of human behavior taken into account in psychology? What is the place of culture in this discipline? What can be the contributions of psychology to the understanding of intercultural communication? The theoretical contributions will be brought through numerous examples and activities so that the participants can establish links with their practices and concerns and develop a "psychosocial and cultural" approach to intercultural communication. Each participant will present a detailed analysis of a personally experienced (or sufficiently known) situation by applying concepts and ideas learned in the current module. The presentation should include a diagnosis of the situation as well as solutions or suggestions for improvement. Participants are encouraged to select situations they have experienced in their professional practice. The Thesis/Field Project is an opportunity to demonstrate mastery of new knowledge and is thus a crucial and culminating part of the educational process. A Thesis Project aims to apply and extend theoretical knowledge. A Field Project uses theoretical knowledge to improve or enrich practice. Each participant will choose a topic that relates to his or her profession and present it for approval to the MIC Academic Director. Each participant will then develop a proposal/plan and carry out the project under the direction of the MIC Academic Director and a Project Adviser selected from among the MIC professors. Participants are expected to complete their projects no later than three months after the last module of the program. The total workload of the master of advanced studies is approximately 1800 hours, including 500 hours of face-to-face instruction, 900 hours of individual work preparing for seminars, reviewing study materials and writing course papers, as well as 400 hours dedicated to the MAS Personal Project. Each module is worth 2.5 ECTS credits, except for the Personal Project Module which is worth 15 ECTS. 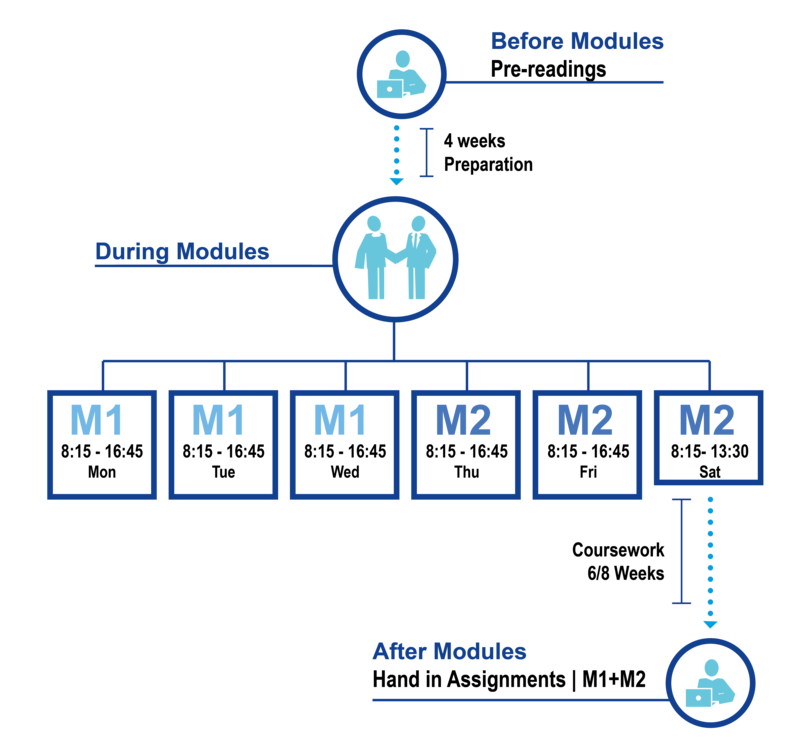 Modules 1 to 18 consist of 24 contact hours each. The diploma awarded is a Master of Advanced Studies in Intercultural Communication (60 ECTS) from Università della Svizzera italiana, Faculty of Communication Sciences.